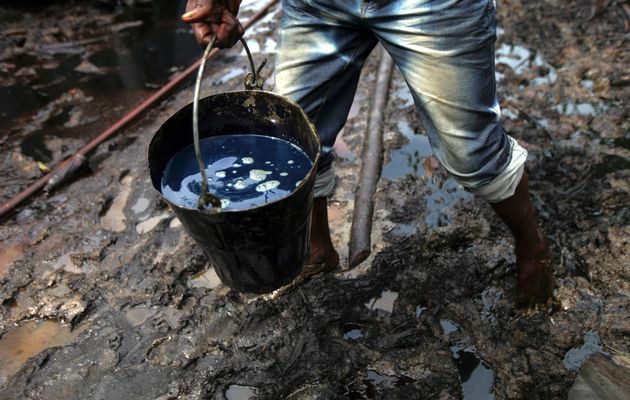 The Central Naval Command of the Nigerian Navy, with headquarters in Yenagoa, Bayelsa State, has handed over 20 suspected crude oil thieves to the Economic and Financial Crimes Commission (EFCC). The handing over of the suspects took place on Wednesday at the command’s Forward Operating Base, Formoso, Brass, Bayelsa State. The suspects including 18 Nigerians, one Camerounian and one Ghanaian were on board the vessel MV ELMINA. The Commanding Officer, FOB Formoso, Capt. Noel Madugu, said the suspects were arrested at Sangana River in Brass Local Government Area of the state. He said that during the time of arrest, the captain of the ship could not provide the relevant documents to lift crude oil. Capt Madugu also said the suspects declared they were loading Automated Gas Oil (diesel), but when the products were tested, it was discovered to be crude oil. Capt Madugu, who paraded the suspects before handing them over to the officials of the EFCC, Port Harcourt office, noted that the culprits were arrested around 1.30am local time on August 7, 2014. The commanding officer said: “About 1.30am, August 7, 2014, MV ELMINA was intercepted coming out of the creeks of Sangana River entrance in Brass Local Government Area of Bayelsa State. “The vessel and her crew were intercepted by NNS BOMADI while on routine patrol of the area. “Upon arrest, the actions of the crew during interrogation indicated that they had carried out the dubious activity as they refused initially to answer their radio until several warning shots”. Madugu said the ship was however boarded and discovered that she was loaded with crude oil. According to Capt. Madugu, the vessel was safely escorted and anchored at Brass River where she was detained for further interrogation. Madugu gave the names of the suspects as Lucky Osiebe, captain; Adakole Onmoniji, Chief engineer; Monday Esemutoye; Tonwoye College; Collins Ograko; Odaba Divine; Dutie Ezetu; Frederick Onwoievbe; Bonley Atangeho and Dover Abruda. Others, according to Madugu, are Joe Richard, Campala Lewis, Efe Godday, Aaron Amohefe, Reuben Dabbi, Joseph Koey, Ponmile Gideon, Wafo Marcel, Dominion Agbo and Akinbolu David. 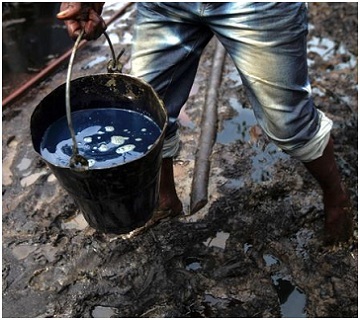 The Nigerian government had ordered the Navy and other security agencies to tackle oil theft in the Niger delta region,as it was affecting revenue generated from crude oil sales.